A complete list of pieces sung by Belvedere Singers since 2012. Belvedere Singers are a Swanage based choir which was formed in 1989 as an offshoot of the Swanage Choral & Operatic Society; the choir was named after the Swanage house where the first meetings of the choir and rehearsals took place. 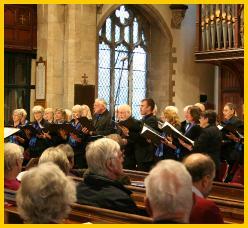 In January 2015 the choir became a registered charity no 1160197, the objects of the charity being to advance, improve, develop and maintain public education in, and appreciation of, the art and science of music in all its aspects by any means the trustees see fit, including the presentation of concerts and recitals. We are a mixed group of amateur singers who meet weekly to rehearse and then perform concerts in the Swanage area. We are a non-auditioning choir and members vary widely in ability from competent musicians and performers, to those who have joined the choir because they simply enjoy singing. As well as learning from our Musical Director, we support each other to improve our understanding of music and singing, and we have a lot of fun in the process. Choir members pay £130 per annum membership fee, payable yearly or in two instalments of £65 each. Funds are also raised through a number of other activities, including raffles, profits on refreshments, table top sales and donations. We meet on Tuesday evenings from 7.15pm to 9.15pm with a short break for refreshments. Rehearsals are at St Mark’s CE VA Primary School, High Street, Swanage BH19 2PH. There is parking on site. Rehearsals start in September and continue until the May concert. There are also short breaks of two weeks each at Christmas and Easter. New members are always most welcome. Our two main concerts each year are held at St Mary’s Church in Swanage and, over the years, we have performed our Christmas concert in support of Friends of Swanage Hospital whilst our May concerts have supported other local charities. We are well known for performing a wide and varied range of music including operatic choruses, religious items, folk songs and popular songs from stage and screen. A commissioned work “From Field to Coast” by Richard Nye with words by Ian York, was first performed in 2009, has been published by a Canadian publishing house, Lighthouse Music Publications. More recently, the choir premiered a new work by a young local music graduate and composer, Matthew Clarke, “When a Lad Goes to Sea” at our May 2016 concert.